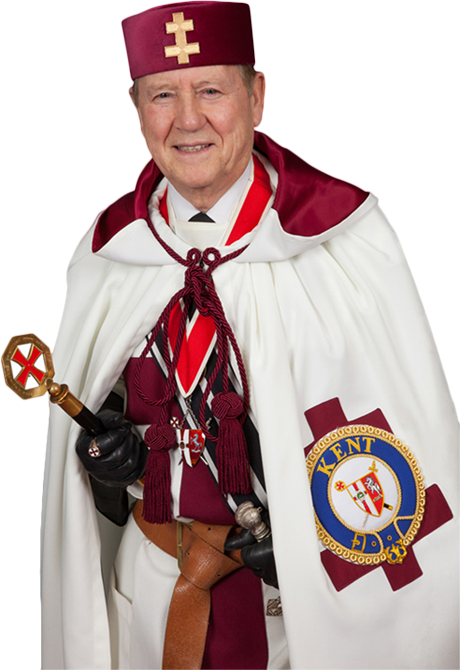 Welcome to the website of The Provincial Priory of Knights Templar of Kent which I hope will be of interest, and of use to both Knights of the Order and to Freemasons who wish to learn more and may be thinking of joining. The Order is made up of Christian Freemasons, and has the longest title of any Masonic Order! We utilise the history and practises of the medieval Knights Templar as a basis for our ceremonies, although we have no direct link with those "Knights of Old". The Great Priory of the United Orders, which is based in London, manages the Order, via a number of "Provinces" or "Provincial Priories" throughout England and Wales and many other parts of the world. The Provincial Priory of Kent, constituted in 1847 encompasses the Kent County boundary with meeting places from Welling and Bromley in the west to Margate and Dover in the East. I have had the great privilege of becoming the head of the Province in December 2015. A Province is made up of a number of private units called Preceptories. In Kent there are 23 Preceptories meeting at Masonic Halls in many towns throughout the County, and strangely enough two in central London! The oldest is at Canterbury, with the newest being established at Dartford as recently as 2002. You will find within the site information on all of these Preceptories, as well as historical and current news items. If you require more info, there are links and contact details available. Please feel free to browse, whether you are a member or visitor, and I hope that you will find something of interest within its pages and return on a regular basis.